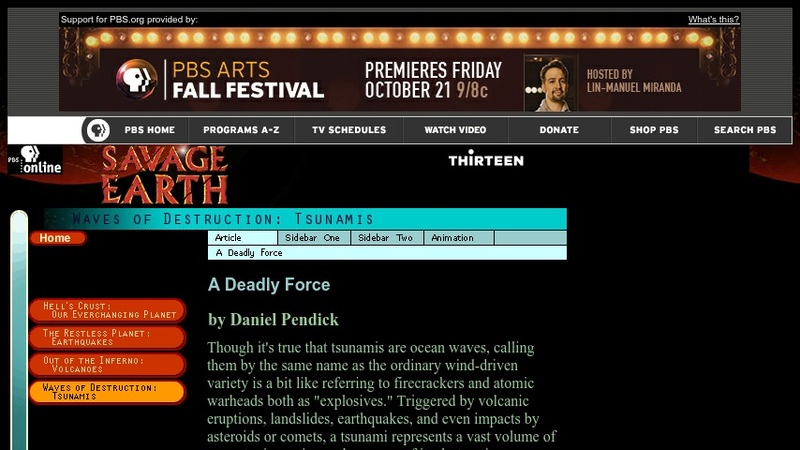 Web companion to an episode of the PBS/WNET television series "Savage Earth" devoted to tsunamis. The homepage article provides a brief overview of the mechanism that creates tsunamis, the enormous energy they release, and the role of plate tectonics in earthquake and tsunami generation. Sidebar pages discuss tsunami monitoring and advance warning, and geologic investigations that reveal evidence of destructive tsunamis in the past. There is also an animation that shows how an earthquake at a subduction zone can cause the sea floor to snap upward abruptly, displacing water and generating a tsunami, and a video interview with a survivor of the 1946 tsunami that struck the Hawaiian Islands.